From our hearts to yours, this is our story! Serving The Area With The Finest In Baked Goods Since 1925. The sweet smell of fresh baked goods have drifted on the morning air throughout Cambridge since 1925, from Kennedy’s Bakery in Downtown Cambridge. Members of the family have been getting up at the crack of dawn for over 80 years, beginning with W.A. Kennedy. In the 1930’s, Bill Kennedy continued his father’s tradition, and today the family business is operated by Bobby and sister Patty, third generation Kennedy’s. Serving the area with the finest in baked goods, the same promise we have made to you since 1925 still holds true today. 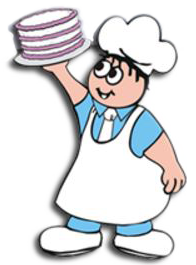 As always, everything at Kennedy’s Bakery is made from scratch daily using the same family recipes that have been satisfying customers since 1925. As featured on Discover Cambridge. Kennedy's Bakery © 2019. All Rights Reserved.